Writing a novel about Titanic was a long-held ambition of mine. There was always something about the era, the images of the ship, and the story of the tragic maiden voyage that I found timelessly powerful, tragic, and romantic. After I had talked myself out of tackling such an enormous story for years, the centenary year came along in 2012 and gave me the final push to write about Titanic and her powerful legacy. 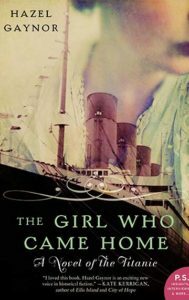 THE GIRL WHO CAME HOME was inspired by the true events surrounding a group of fourteen Irish emigrants who left their homes in County Mayo, Ireland, to travel on Titanic to relatives in America. The group is known locally as the Addergoole Fourteen. When Titanic sank the loss of eleven passengers from the Addergoole group represented the largest proportional loss of life from one region. For the purposes of the novel, the names of all members of the group have been changed and, although based in fact, this is very much a work of fiction. The inquiries into the Titanic disaster, movies and books that followed, survivor accounts, newspaper reports, and continued media fascination with the event have all provided an immense amount of detail about the ship and her passengers. Details regarding Titanic’s construction, her fixtures and fittings – even down to the handles on the dinner knives – provide a rich seam of source material for anyone interested in the event. Through the process of writing the book, I found myself lost for many fascinating hours of research and hope that I have drawn on all the information available on Titanic to portray, authentically, what life was like for passengers and crew aboard the ill-fated ship. In writing THE GIRL WHO CAME HOME, I wanted to explore the aftermath of the sinking: what happened to survivors in the lifeboats? What happened to survivors once the Carpathia docked in New York? How did relatives of the passengers hear about the event and what was that experience like for them? These aspects of Titanic’s tragedy are, perhaps, less well known and have been less well documented, and it was these—the survivors’ experiences and the ordeal of family and friends back home—that I felt compelled to explore in the novel. After reading many detailed – and incredibly moving – survivor accounts, I hope to have accurately portrayed what the experience was like for the survivors who made it onto the rescue ship Carpathia and into the New York hospitals. I also hope to have sensitively portrayed the experience of family and friends, many of whom went for several days without accurate information regarding the fate of their loved ones. We can only imagine how difficult those days and nights of not knowing must have been. For further information on the Addergoole Fourteen, visit http://www.addergoole-titanic.com/or visit Lahardane village in County Mayo, where you can walk Addergoole’s Titanic trails, featuring the homesteads, many now derelict, from which the Addergoole Fourteen left for a better life in 1912.